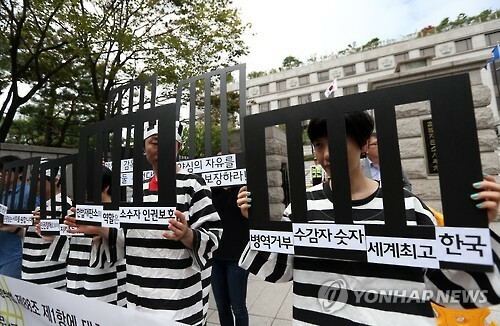 May 2015, a Gwang-ju province court found conscientious objectors innocent of charges brought by the government about their refusal to serve in the military. This unprecedented verdict has reignited an old controversy which has been debated since 2004. Final decisions on whether these objectors are against the law or not, and on allowances for alternative forms of service will be concluded. After the Public court of the Constitutional Court which started in July, and the parliamentary inspection of the administration, which will start on September 4th. There are many factors to consider during these processes, and one of the most important factors is public opinion. However, despite its importance, the problem is whether interest in this controversy among people is sufficient enough. To check if this is the case, The Post surveyed 116 aged from twenty to twenty-five on their knowledge about this controversy. The resulting statistics were quite surprising. Among 116 students, only 49 percent of the participants said they have had thought about this controversy as to whether the objectors are breaking the law. 51 percent replied that they have never heard of this controversy and know nothing about this. Who are the scientious objectors? Unlike Korean society where the word “conscientious” means a moral value toward every person, the word “conscientious” in other foreign countries means individuals’ several set of values which differs among every person. It can be said that the definition has changed a little during translation, which may definitely cause confusion. Objectors usually protest military service to avoid training that has relation with war and battle. Some people claim that objectors are religious fanatics, and their claims should not be taken seriously. However, according to the Center for Military Human Rights Korea (CMHRK), there are also ordinary people have any religion among the objectors. Thus, according to the interview, the misapprehension that objectors are fanatics was revealed to be false. Every year, about 600 men object to their compulsory military service and go through a trial or are sent to jail for refusing their obligation. About 16,000 people have been imprisoned for this act. Courts usually sentence them to 18 months of prison labor, which is little shorter than the average length of military service. Because of this short length, there are suggestions that it can be an expedient measure of avoiding obligation. People who disagree with the establishment of a law for conscientious objectors insist on their opinion for three main reasons. Firstly, they point to the ambiguity of the criteria on whether a person is a sincere objector or just a draft evader. Dissenters claim that any criteria cannot be perfect since a person’s values and thoughts are not things that can be accurately identified. Secondly, opponents point out that the problem of fairness for other people should be taken into account. There are not many people who really want to join the military service. They insist that if the country accepts exceptions, other people might feel dissatisfied with mandatory service even more. The last one is the situation of South Korea. As everyone knows, South Korea is in a ceasefire with North Korea, and a possibility of war always remains. They say that allowances for objectors are coming too early in the day since Korea is not fully secure yet. On the other hand, people who support the establishment of a such law give two main arguments against these claims. According the UN commission for human rights, Korea is one of the countries where minorities cannot speak up to express their opinions. With this fact, supporters say that this legislation can be an opportunity to become one of the countries where everyone in society can speak up with their own voice. Supporters also claim that Korea’s ceased war situation cannot be an obstacle for this. They point out the fact that Ukraine which took the war between Russia and Israel which is in battle with Middle East countries, have both already approved alternative service as constitutional. They say the claim that our situation is unique cannot be a valid reason based on the situation in these countries. Additionally, they suggested some alternatives for problems that are likely to happen. They say if alternative service is about 36 months length and the workplaces hold insufficient facilities such as AIDS or LEPRA hospitals, it can filter the sincerity of the applicants. Taiwan is a country that has already adopted this kind of system. In the first year after this system was implemented, applicants for alternative service outnumbered the number of people who applied for traditional forms of military service. However, as time goes by, far fewer people have applied for this service because it was too harsh for people who are lacking in sincerity. Supporters say if this kind of system can be applied here, the ambiguity of criteria to define an objector can be solved. They also suggest that government should make an extra institute to care these people efficiently. Obligatory military service has been an implicit law throughout Korea for more than fifty years. If exceptions for people are approved in the courts and in law, many changes will occur. So in order to lessen the unexpected conflicts and promote change, a careful examination on whether this is acceptable or not is crucial.